This page is about the aircraft Ki-43-II. For other uses, see Ki-43 (Family). 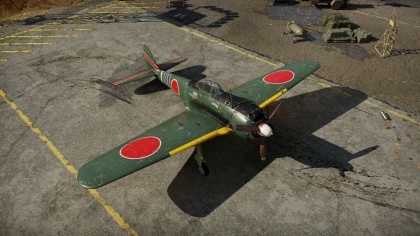 The Ki-43-II Hayabusa is a Rank II Japanese fighter with a battle rating of 1.7 (AB), 2.0 (RB), and 2.7 (SB). It was introduced into the game sometime prior to Update 1.27. 661 300 523 ~?? ~? The single-seater Japanese Nakajima Ki-43 Hayabusa (Peregrine Falcon) fighter was designed to replace the Ki-27 in the Japanese Imperial Army’s Air Force. 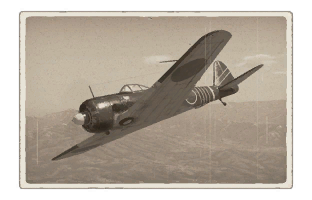 The Ki-27 design was so successful that, without resorting to the competition that usually occurred among aircraft manufacturers, the Air Force authorized Nakajima to create an improved model. The main requirement for the new fighter was a high top speed of at least 500 km/h but with the same maneuverability as the Ki-27. The first three prototypes were prepared and tested in 1939, but their maneuverability was inadequate. Therefore 10 pre-production aircraft with different configurations were considered. Two of them used the new “butterfly” combat flaps, which largely decided the issue. With the flaps, the plane became much more maneuverable. In autumn of 1942, the Ki-42-IIA entered production. The main differences between the Ki-42-IIA and previous models were its more powerful Ha-115 motor, its 1130 hp output, and its three-bladed propeller (the previous model had a two-bladed propeller). The wings were reinforced to hold 250-kg bombs, and the lighter machine guns were replaced with large-caliber ones. In addition, the wing fuel tanks were self-sealing, and pilot protection was enhanced with 13 mm of armor (previous models, to lighten the aircraft, did not include protection for the pilot or fuel tanks). All in all, 5919 Ki-43 fighters were produced, most of which were of the Ki-43-IIA design. This page was last edited on 5 April 2019, at 01:25.